When the City Council takes its final vote on Councilmember Barbara Bry’s short term vacation rental ordinance Wednesday afternoon, there aren’t likely to be any last-minute flip-floppers on the initial 6-3 vote taken last month. Bry, along with Lorie Zapf, represents coastal communities whose residents have been calling for years on the city to restrict the growth of vacation rentals. Their votes aren’t going anywhere. 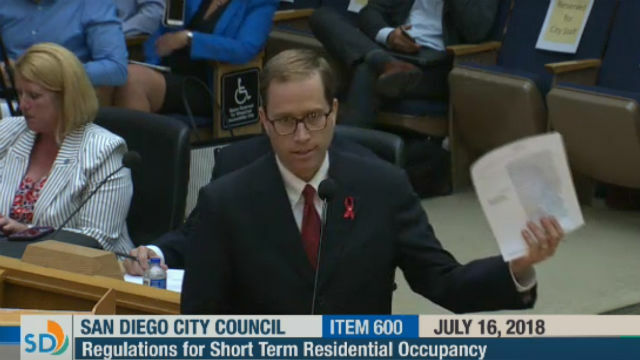 And as the impact of vacation rentals on San Diego’s housing crisis became impossible to ignore, other councilmembers got on board and stood up to the predatory business model of Airbnb and other vacation rental platforms. Chris Ward sensibly changed his position on STVRs and voted to support Bry’s ordinance, and Georgette Gomez, Mark Kersey, and Council President Cole are holding steady on their decision to side with Bry and San Diego’s residents rather than out of town investors. By showing Airbnb the door, San Diego is poised to regain housing for its residents. And in the midst of an epic housing crisis, this is welcome news indeed. For all these reasons and more, the six “yes” votes for Bry’s ordinance aren’t going to change, despite the best efforts of a well-funded campaign by Airbnb’s lobbyists and the local vacation rental industry. Nor are two of the three “no” votes. Chris Cate claims he can’t support Bry’s ordinance because he thinks it will be too difficult to enforce. It’s an ironic stance coming from someone who has gotten in trouble himself for arguably breaking the law over and over again. And since he’s shown he puts lobbyists and campaign donors over his own constituents—and he’s gotten a lot of money from the vacation rental industry—there’s no chance Cate might finally do the right thing. Then there’s Scott Sherman, who fancies himself a deep thinker and claimed that “the Constitution says that you have the right to own property,” in justifying his “no” vote. You can go check your pocket Constitution, but spoiler alert, it says no such thing. The Fifth Amendment prevents the government from taking property without due process, but zoning laws like the one in San Diego which forbids commercial enterprises in residential neighborhoods have been upheld by the Supreme Court for a century. In any case, Sherman’s vote wasn’t so much ideological as personal, considering his family’s extensive real estate holdings give him an incentive to legalize vacation rentals. That leaves the surprise “no” vote from Democrat David Alvarez. His rambling justification for opposing Bry’s ordinance was vague and confusing, especially considering her proposal is in many ways similar to past positions he’s taken on the issue. This left a lot of people wondering if his “no” vote had more to do with pleasing potential campaign contributors. He’s termed out on the council but is running for a seat on the Community College District board—though that’s not the only office he has his sights set on. He may have calculated that vacation rentals aren’t an important issue in that race, and not worth offending deep-pocketed backers. But if so, that would be a potentially fatal miscalculation for his campaign. Alvarez is facing strong opposition from fellow Democrat Sean Elo, who knows that housing affordability is a major issue for community college students. It’s a bad enough look for a progressive like Alvarez to vote alongside a couple of Republican councilmembers like Cate and Sherman. It’s another thing entirely to betray San Diego’s homegrown community college students who are already struggling to avoid homelessness and hunger. If there is going to be any big surprise in council chambers Wednesday, let it be that Alvarez realizes the error of his ways—and supports Bry’s plan. Matt Valenti is a lawyer, former candidate for City Council and board member of Save San Diego Neighborhoods.